GROSSMONT COLLEGE — Put away the surfboards and sunscreen, its time to get focused on school, but not without something to look forward too, Fall Sports! For many Grossmont College students, the beginning of the Fall Semester marks not only the end of summer and the beginning of the academic year, but also the beginning of their respected sports season. But a novice sports fanatic might question, ‘What are the Fall Sports?’ Here’s a look at four Fall Sports at Grossmont Community College. Football: Grossmont’s team comes off a modest season in 2010 finishing 6-4 with a post season loss to East Conference Runner Up Santa Ana College Dons in the Beach Bowl, 52-43. This year, Coach Mike Jordan looks to lead his Griffins in the season opener on the road against rival San Diego Mesa College on Saturday, September 3, 2011 at 6p.m. Women’s Soccer: New Head Coach Dave Ridenour and The Lady Griffins dropped the season opener, 1-0, at home against Golden West. They look to rebound Friday September 2, 2011, on their home pitch against El Camino at 1pm. 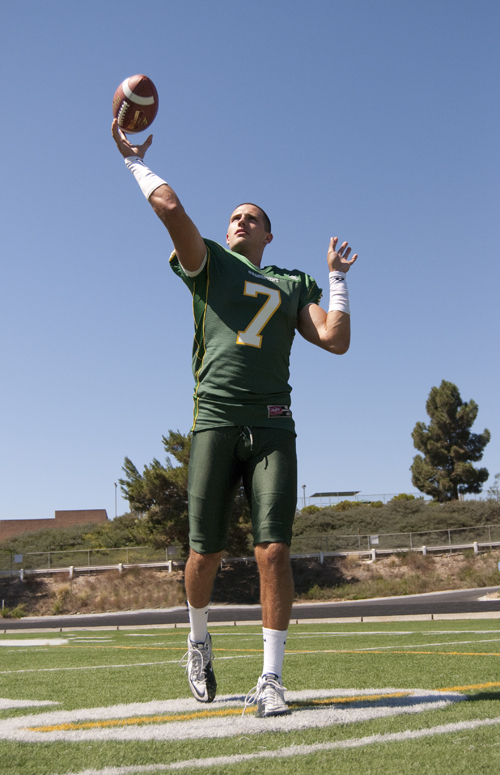 GROSSMONT COLLEGE– Quarterback Ryan Woods and defensive tackle Henry Simon are among a group of players from the 2010 Grossmont football team who have received and accepted offers to continue their football playing at four-year institutions. Ryan Woods will be going to San Jose State University as soon as he finishes classwork at Grossmont in June. Simon is headed to Iowa State in the summer. Woods, the Grossmont offensive MVP and second-team all-conference, had received multiple offers from Division 2 and Division 1-AA schools, but had his heart set on playing for a Division 1 football program. At San Jose State of the Western Athletic Conference, Woods would get a chance to play the likes of Stanford, UCLA, BYU, as well as conference opponents including Nevada, Fresno State, and Hawaii. Another factor in his decision was that San Jose was an hour and a half way from his hometown of Sacramento, making it much easier for his family to come see him play. Woods still has a red shirt year available, which might be used this year because SJSU has a returning senior quarterback. SAN DIEGO — When the San Diego Hall of Champions inducts Lincoln Kennedy on Tuesday, Feb. 15, into the ranks of its Hall of Fame, , Grossmont College can claim a small portion of the credit for the All-Pro, All-American career of the eight-seasons Oakland Raider. Or, then again, you might say the college provided a big part contributing to his success. As a student at Morse High School, Kennedy stood 6 foot 6, weighed 330 pounds, and wore size 17 cleats, according to an article by Chris Jenkins that ran in Friday’s San Diego Union-Tribune. Kennedy’s head was so big that a helmet couldn’t be found to protect him–until an extra- extra-large one was found at Grossmont College. His head safety at last provided, Lincoln Kennedy, a gentle giant, played well at Morse High School and went on to college in Washington and to a pro career. Here’s a link to Jenkins’ story in the Union-Tribune.